Come to the inviting Grampians mountain ranges to relax and enjoy an array of fun-filled and adventurous activities with your loved ones. For those looking for a thrilling and adrenaline-pumping touring experience, you should try one of the horse riding tours available in this region. Come to any of the horse riding centres and try this popular activity which is a great way to explore the region’s most scenic offerings. Your equestrian tour in the Grampians will certainly offer you an adventurous and fun-filled experience. First time riders can take a short training session before choosing to take a horseback riding tour and experienced riders can simply jump on an go! Based on the difficulty, the horse riding activities are categorised in to easy, medium and advanced classes. Visitors can make their own choice based on their own experience, and enjoy taking a fun-filled ride across the stunning landscape and its surroundings. This activity is suitable for younger children as well, as all tours are run by an expert rider. Indulge in the spectacular views of the Grampians National Park and its surroundings by taking a self-guided or group horse riding tour. Most of the tours are private and offer you an option to custom-tailor your trip. The tour operator will choose your horse based on your weight and riding experience, and if you have booked a private tour, your operator will run through some of the many horse tracks throughout the region. Group tours are offered at a discounted price and guided by an expert rider who narrates about the history, culture and attractions of the region whilst also providing you with some helpful horse riding tips during your ride. I would like to organise a trail ride from my family my daugthers are 9 and 11. What would be the best? 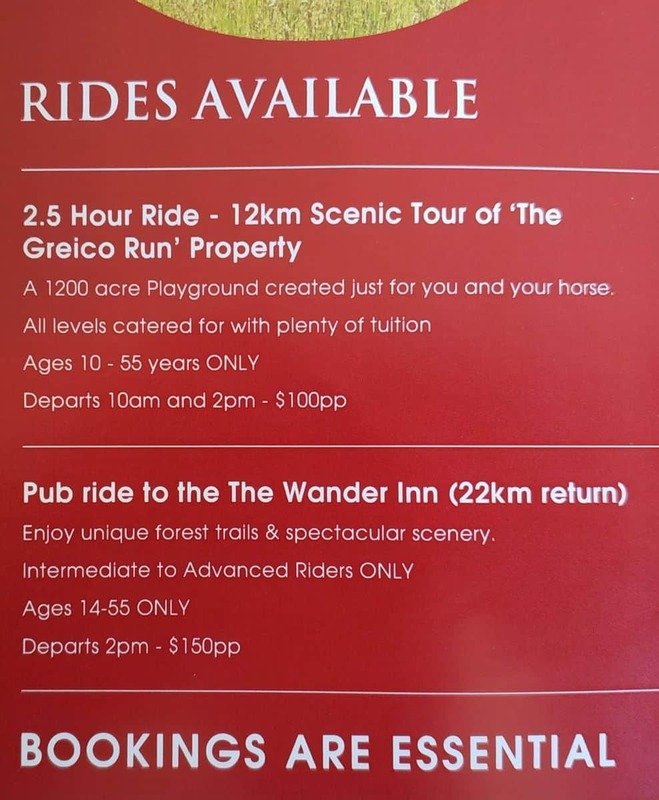 I have looked up what horse riding is available in the Grampians and there only appears to be one provider; called “Grampians Horse Riding Adventures”. Be that your daughter is 9 years old, it looks like horse riding this won’t be possible as the age ranges on the website only mention 10 – 55years (with children from 10 to 12 years must be accompanied on the ride by at least one parent or guardian). I was going to suggest giving them a call and seeing if there was any leeway, but since it states on their riding details page that “10 years to 55 years NO EXCEPTIONS”, it doesn’t seem like this will be possible. Hi, I will be in the Grampians from the 19th until the 22nd of November and wanting to book a self guided horseback ride through the Grampians. Can you please email me a link where to book in advance and some different rides and prices. Thanks! 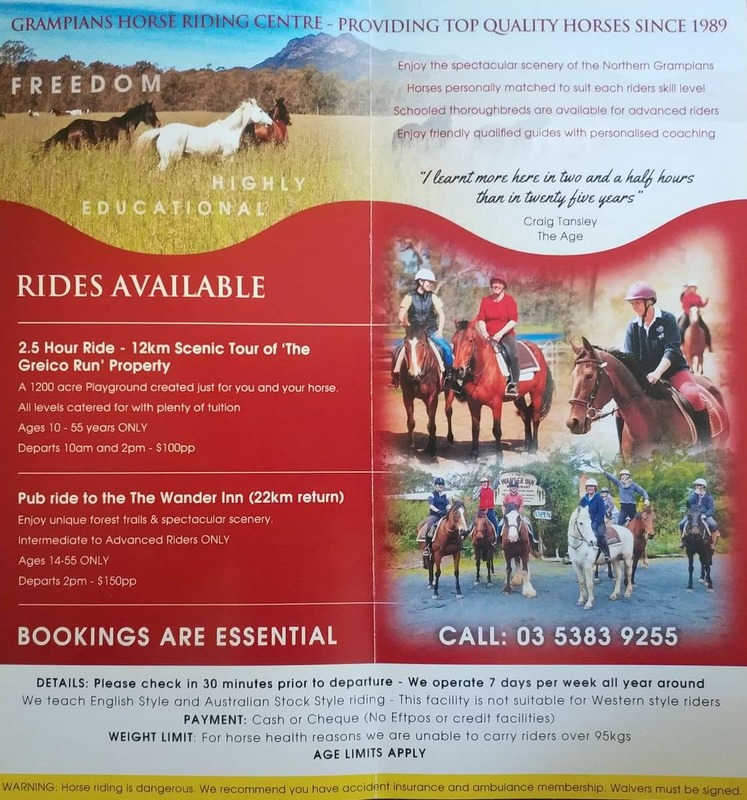 The biggest and best operator in the area is Grampians Horse Riding Adventure. You can find the types of tours and prices in the link. 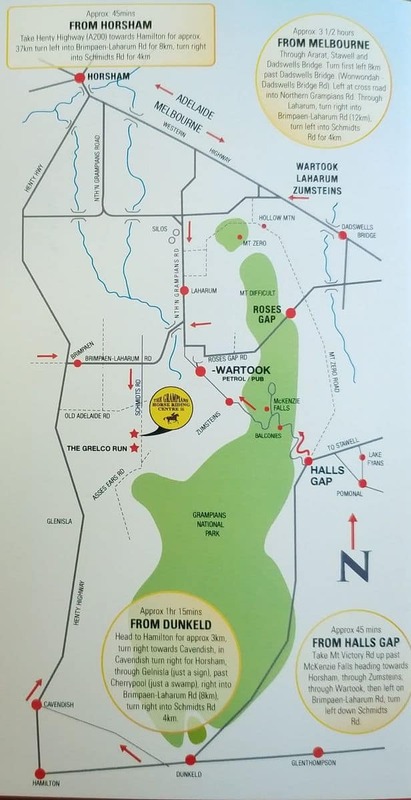 As for a self guided tour, I am not sure if they offer this service, however they do offer a 12km advanced tour where there are opportunities to canter and try your skills on some challenging terrain. Enjoy your stay in the Grampians! Hi, I will be in Halls Gap from the 29th-31st of July with a group of 8-10 Adults. Can I get a quote for horse riding, keeping in mind we are all beginners and are after the shortest course as we are limited with time. Thanks. You can select morning or afternoon tours. Tours run for around 2.5 hours are are $100 per person. Contact the provider to see if they offer any sort of group discount. Enjoy tour trip to the Grampians! Grampians Point covers everything there is to do and see in the Grampians in Victoria. Mountains, lakes, waterfalls, attractions, events – we have everything here!